AMTECH THREE Way Control Valve is a rigid and comparatively compact type , which is designed to work very accurately various media like control water, oils, steam, and other industrial fluids. Three way valve package is accurately perfect and suited to address the space limitations of the the OEM industry.Three Way control valve is durable , very reliable, and easy to select. The internal valve trims are mfg and designed in SS 304/SS 316 to ensure long service life to avoid maintenance cost. We have three way control valve may be used for both converting and diverting applications. Amtech Three Way always meet the both EN and ASME standards. 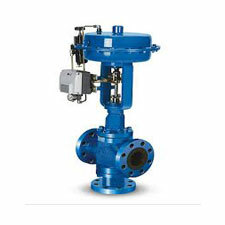 The valve is operated with pneumatic diaphragm operated ,as well as we have design for electric operated. Also ,We can provide position controller. FLANGED TO BS TO TABLE "F"
PSIG (30 KG /CM2) FOR 150# TABLE "F"